This is the fourth issue from Vocalion with music by or interpreted by Robert Farnon and his orchestra, a heyday of the light music stable from the 1950's. This time we have the famous 'Two Cigarettes in the Dark' LP and the less familiar 'Pictures in the Fire', the latter is no less memorable than the more popular first album. Tunes by Rodgers and Hart dominate proceedings with the legendary 'Where or When' and 'Isn't it Romantic' in company with Kern and Gerswhin showpieces such as 'The Way you look Tonight' and 'Love Walked In'. All are given lush romantic treatment by Farnon and his orchestra which, if not as opulent as Mantovani, is certainly very 'period'. 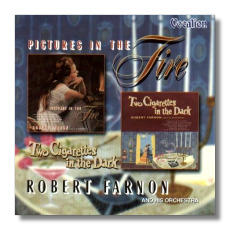 'Pictures in the Fire' includes three original Farnon tracks apart from the title single, these are: 'Lazy Day and 'Sophistication Waltz' together with the sentimental 'Summer Love'. These contain the touch of the master but his interpretations of Young's, 'When I Fall in Love', Adler's 'Hey There' and the ubiquitous 'Story of Tina' are also as good as it gets. Dutton's remastering brings out the original colour and sweet string sound and David Ades' contribution is an entertaining read altogether. I cannot recommend this album too highly, especially if you enjoy the vintage 50's period which was such a success for light music re-incarnation.